Of course, pasteles are Taino. What else would they be? Masa from guineo, yuca and yautia with a tasty filling, wrapped in banana leaves with a schmear of achiote, and cooked in a large kettle, couldn't be anything but a Taino delicacy. And, of course, guanimes -- my childhood favorite. Even today, making pasteles is still a family affair, for example, your Mom might grate the yucca or guineo, while an aunt will prepare the masa, grandma could be seasoning the meat to perfection, and a cousin can literally wrap the whole process up nicely. As I understand it, in Boriken, there were at least three and possibly more original “pasteles” - one made from mais (corn), one from yuka, and another from yautia. If you thought you were the only Boricuas making pasteles from yuka, my sisters and brothers, – we Tainos taught you that hundreds of years ago. In fact, yuka and yautia are Taino words. “Mais” derives from the Taino word maisi. And the Taino word for pasteles made from corn is guanime. I beg to differ. Pasteles are derived from various dishes made in North Africa and elsewhere on the continent and were brought to Spain via the Moors. Not sure if you've ever ever had a chance to have Grape Leaves, but this in essence is a Pastel type dish (very similar to Pasteles de Arroz). I believe the Chinese also make a similar dish which takes HOURS to cook via boiling. At the link above is a refutation of the origins of pasteles. What is most definitely Taino is Guanime and possibly Empanadas de Yuca (not many Puerto Ricans make these) which in many ways are Pastel like. Sancocho is another dish brought over from Spain, but adapted using local ingredients (ie Indigenous Tubers (Viandas)). Here is a video showing the Chinese "Pastel", interestingly enough they contrast it with Puerto Rican Pasteles. Empanada Gallega, seems to be the precursor in terms of filling for Pasteles. 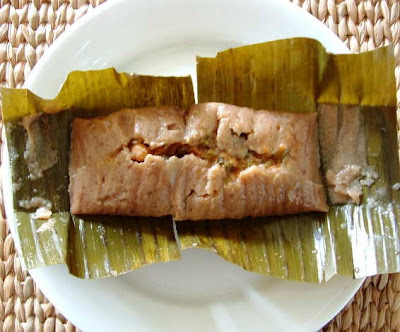 In reality Pasteles are born from a fusion of Taino, African and Spaniard food ways.